Ramanuja’s divine personality was recognised even during his lifetime. Pillailokam Jeer, in his work, ‘Ramanujarya Divya Charithai’ narrates that Sri Asuri Sarvakrathu Keshava Dikshitar and Kanthimathi from Sriperumbudur worshipped at Sri Partharasarathy temple in Chennai, and performed Putra Kameshti Yagam. Lord Parthasarathy appeared in their dream and blessed them that He would himself be born as their son in order to explain the import of the teachings of the Gita. 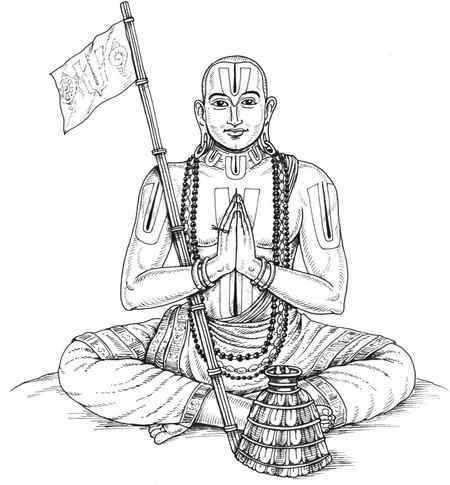 Ramanuja was born on April 13, 1017 in the Tamil year Pingala, on the 12th day of the Chaitra month, under the asterism of Thiruvadirai, Kataka lagnam (zodiac sign, Cancer. This year, his birthday falls on May 1. The Triplicane temple celebrates all the festivals of Sri Ramanuja every month independently. Processions are organised without Lord Parthasarathy accompanying Ramanuja. Only three days in a year — Tamil New Year’s day, Vidayatri Sattrumarai Day (after the annual Brahmotsavam) and Vasantha utsavam days — Ramanuja is accompanied by Lord Parthasarathy in a procession around the mada streets . According to scholars, since Sri Parthasarathy Himself was born as Ramanuja there was no need for Ramanuja to be accompanied by the Lord during the processions. Since childhood Ramanuja possessed prodigious powers. 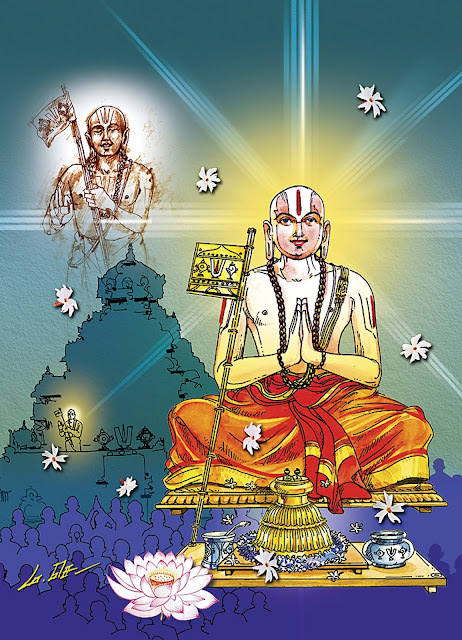 Alavandar chose him as the future Acharya, who would ascend the Sri Vaishnava Peetam after him. Ramanuja had promised to fulfil the three wishes of Alavandar, whom he could not meet during his lifetime. Accordingly, he completed the commentary on Brahma Sutras. There were two other wishes to be fulfilled. 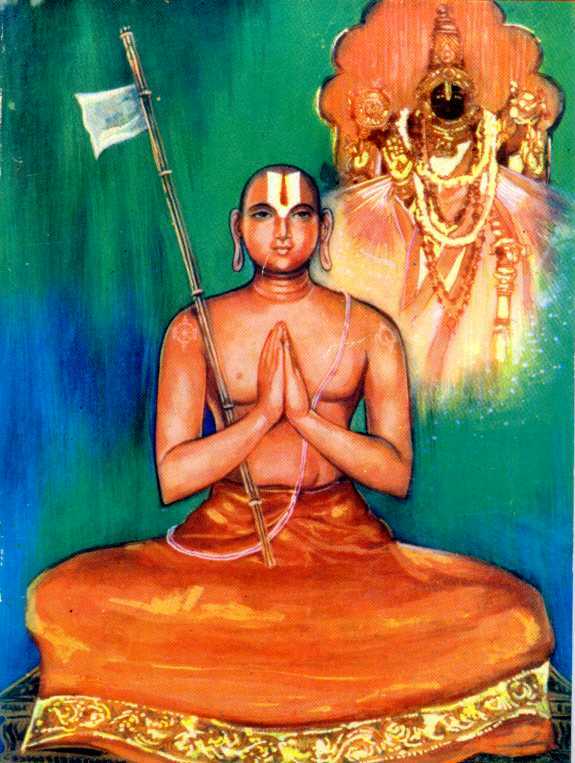 Ramanuja had undertaken the task of spreading the gospel of Nammazhwar with a commentary on Thiruvoimozhi. Years passed by but Ramanuja did not attempt to write the commentary. He said that the subsequent followers of the Vaishnava tradition will consider it as final, whereas the work warranted interpretation and beautification. He went to Tirumalarincholai and worshipped Azhagar and after a few days proceeded to Alwar Thirunagari with his entourage of sishyas. Taken up by the sight of the sacred tamarind tree, he prostrated before it and prayed that the satari at the shrine should be known as Ramanuja. 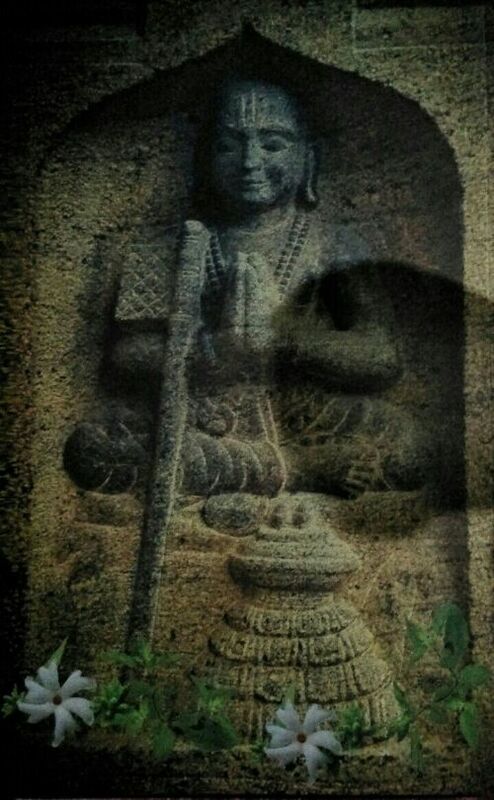 Retiring to the Mutt, late at night, he was murmuring the pasurams. Seeing that Pillaan, son of Periya Thirumalai Nambi, asked Ramanuja whether he was contemplating the pasuram ‘Thirumalirincholai Malaiye Endren Enna...’ (Thiruvoimozhi 9-8-1). Ramanuja, amazed at Pillan’s ability to read his mind, blessed him that he alone was competent to write the commentary on Thiruvoimozhi in fulfilment of the vow that he had taken at the time of Alavandar’s demise. Pillaan, named as Thirukkurugaibiraan Pillaan after Sadagopa, went on to write the first commentary on Thiruvoimozhi, known as the sacred 6,000 padi vyakhyanam. Ramanuja’s third promise was to appoint his successor. This was realised through the twins of Koorathazhwan. One day at Srirangam, Koorathazhwan could not go out for unchavrithi due to heavy rain. In the evening, when his wife Andal heard the ringing of the temple bell, she wondered if Lord Ranganatha could have his aravanai when his ardent devotee Koorathalwan was starving. At that point, Uthama Nambi arrived at the doors of Koorathalwan with aravanai prasadam. After consuming the prasadam, Andal delivered twins. Ramanuja was thrilled to hear this and directed Embar to bring the babies. He named them Parasara Bhatta and Veda Vyasa Bhatta. 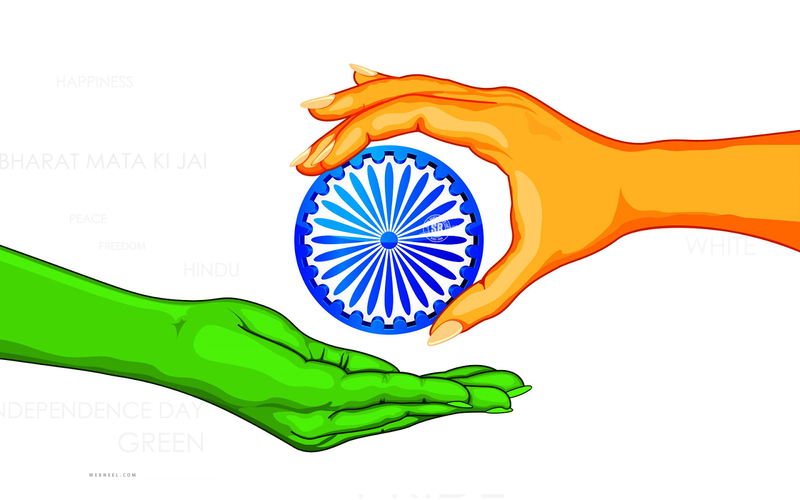 Parasara Bhattar became the leader of the Vaishnava tradition and wrote the commentary on Vishnu Sahasranamam and Veda Vyasar wrote the Acharya Hridayam. Thus was fulfilled Alavandar’s third wish.